This entry was posted in General and tagged Best Practices, Global Health by Editor Equity/Equidad. 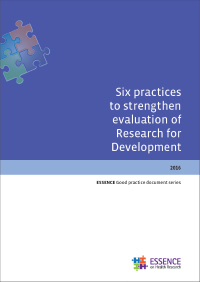 The ESSENCE on Health Research initiative of funders has published a new good practice document: Six Practices to Strengthen Evaluation of Global Health Research for Development. It is the result of 25 funding organizations coming together to agree on best practices and to advocate for them. Build on established evaluation standards. Develop rigorous design, approaches, methods and metrics. Identify users and intended uses of the evaluation. Plan according to the anticipated timeline of influence. Foster collaboration among diverse stakeholders. ESSENCE is an initiative of funding agencies to improve the coordination and harmonization of research capacity investments. It is hosted at Special Programme for Research and Training in Tropical Diseases (TDR). How to obtain this report : click here.